One of three stories. Sweet second chance/reunion story. I have read One Night Under the Mistletoe so far but look forward to reading the rest of the stories. One Night Under the Mistletoe was a touching second chance/reunion story. Juliet was hurt by Monty's rejection years earlier when a mistake by Monty leads to marriage. As they worked through their fears and pain, with truth between them, they find their way back into each others hearts. This was a wonderful read, tears included. I loved both characters. 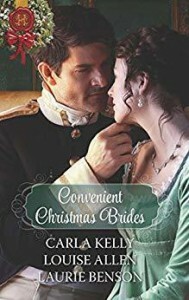 I highly recommend this story, which is the second story in the Sommersby Brides series. I received an ARC of this story through the author, and this is my unsolicited review.